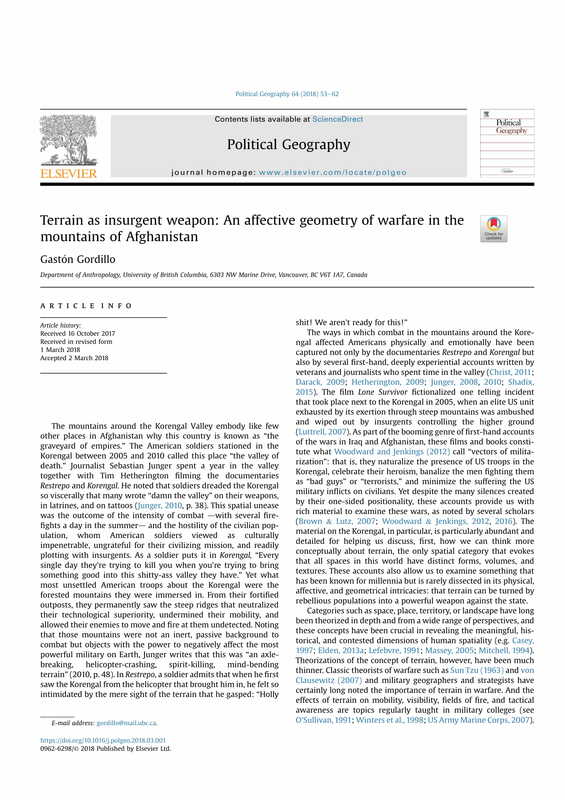 Gastón Gordillo, “Terrain as insurgent weapon: An affective geometry of warfare in the mountains of Afghanistan“, Political Geography (requires subscription – first page available to preview or click on the image). No abstract, so I’ve taken this summary from Derek Gregory’s Geographical Imaginations site. In analyzing how bodies are affected by and affect terrain, an affective geometry can be seen as a materialist phenomenology that conceives of human bodies in their subjective interiority and dispositions and also as mobile, self-propelling bodies that in situations of combat dand as long as they remain able bodiesd walk, run, climb rocks, duck on the ground, fall in ditches, shoot, feel exhausted hiking a mountain, and feel pain if hit by gunfire. Gastón and I have been in dialogue for some time about ‘terrain’, and we organised two AAG conference sessions on this a few years ago before he visited Warwick to discuss some of his work with colleagues and PhD researchers. Great to see this piece as a continuation of the conversation. This entry was posted in Gaston Gordillo, terrain, Uncategorized. Bookmark the permalink.